This is the ninth time I have witnessed, usually from afar but not this time, a party transition in the administration of the United States government. British prime minister Harold Macmillan famously described the process in 1960–61 as like the takeover of a small Italian medieval city by a new family of gangsters. This was the transition from Dwight D. Eisenhower to John F. Kennedy, one of those rare generational changes in American history. President Kennedy was 27 years younger than President Eisenhower, and Joseph P. Kennedy, the president's father, was just two years older than President Eisenhower. The 1960 transition was a portentous generational change from those of fighting age in World War I (Eisenhower and Truman had served in France and Roosevelt had been assistant secretary of the Navy) and command age in World War II (they served as president, vice president, and theater commander in Western Europe and the Mediterranean) to those who served in junior roles in World War II (Kennedy, Johnson, Nixon, Ford, Reagan, and Bush all served as junior officers, though LBJ only briefly as a combat aviator, as Roosevelt ordered all congressmen back to their legislative duties, and Ronald Reagan, though he volunteered before Pearl Harbor, had a soft war making demonstration films). Kennedy, Johnson, Nixon, Ford, and Bush were all decorated combat officers; all did their duty and served as ordered. The 1960 transition was to some extent a handover from Eisenhower and his military comrades – including General Wilton Persons, General Lauris Norstad, and Admiral Arthur Radford — to lieutenant commanders who had made the jump to being commander-in-chief and serving as close Kennedy collaborators through politics, business, and academia; the whole process was highlighted by Kennedy's inaugural address, which remains, next to the two inaugural speeches of President Lincoln, and the first of President Franklin Roosevelt, the most famous in the country's history. Kennedy de-escalated Eisenhower's "New Look" defense policy of threatening the use of America's nuclear superiority if its primary security interests in Western Europe and the Far East were challenged, with a policy of flexible response hinged to the promise to "bear any burden, pay any price" at, implicitly, any point along the world-dividing line between the Western and Eastern blocs. Though he did not get into it in his inaugural address, Kennedy incited the inference that draconian measures would not be applied to aggressions that did not directly assault the survival of the core of the West and the United States itself. The ever-escalated aggression in Vietnam was accelerated by Kennedy's handing over of Laos as the super-highway of invasion in the Laos Neutrality Agreement ("Communism on the instalment plan," as Richard Nixon called it), and the deployment of nuclear missiles and two Soviet divisions to Cuba swiftly followed. President Kennedy was a popular and enlightened president and there is every reason to believe that he would have managed Vietnam more successfully than his successor did. The resolution of the Cuban Missile Crisis — with the withdrawal of NATO missiles from Italy and Turkey (against the wishes of those countries) and the promise of no invasion of Cuba — was no strategic victory for the U.S., but at least it avoided a maximum confrontation and achieved the removal of main-force Soviet units, missiles, and nuclear warheads from Cuba. The Johnson-Nixon transition in 1968–69 seemed to promise a new approach to Vietnam. Ho Chi Minh had rejected Johnson's 1966 offer at Manila of removal of all foreign forces from South Vietnam, a withdrawal Ho could have followed — after a brief, decent interval — with an all-out assault on Saigon. The United States would not have reentered the country to contest that; and, in rejecting Johnson's offer, Ho Chi Minh made it clear that he did not seek just the takeover of South Vietnam, but the military defeat of the United States. Nixon had campaigned claiming he had "a plan," as he patted his breast pocket as if there were such a plan within it, to deal with Vietnam, from whence 200 to 400 American draftees were returning dead every week. There was no such plan and only after a reasonable proposal similar to Johnson's had been rejected did Nixon devise his Vietnamization strategy, to which he recruited an adequate level of support by memorably calling on the support of "the Silent Majority" in November 1969. The majority were there and they answered, and Nixon withdrew from Vietnam, preserving a non-Communist government in South Vietnam; by his agile approach to China, he even managed to recruit Chinese and Soviet assistance in gaining a peace agreement that did not imply any military defeat for the United States. The South Vietnamese had defeated the North Vietnamese and the Viet Cong in the great battle of April 1972, between Nixon's visits to China and to the USSR, with no American ground support but heavy air support; the Nixon plan was based on the belief that the same level of support would be effective again when Hanoi violated the agreement that Washington, Moscow, and Beijing bullied it into signing. It was a reasonable assumption, had Watergate and the systematic destruction of the administration not overtaken all else in Washington. The South Vietnamese and the Cambodians were abandoned to the North Vietnamese, the Viet Cong, and Pol Pot's Khmer Rouge. The transitions of 1960 and 1968 were dramatic. That of 1980 was momentous as well: It was clear that Ronald Reagan's defeat of President Carter would result in a sharp change in taxation and defense spending. There was a generational and psychological transition in 1960, a straight but uncertain change of policy in 1968 to fresh eyes and fresh minds from the discredited "Best and Brightest," and a distinct policy shift in 1980 to supply-side economics and peace through strength. The 1960 and 1968 elections were decided by a hair's breadth; 1980 was a decisive Reagan victory. Yet this election in 2016 is producing a much more profound transition than any of those three did. Though the losing candidate won the popular vote by over a million votes, it was, as the president-elect has called it, a landslide. 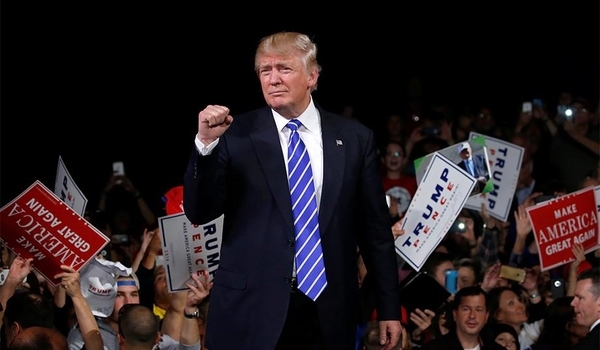 Donald Trump is the only person in history to be elected president of the United States without having held a prominent public office or military command, the only one to have paid for his own campaign for the nomination, the only one to have run successfully against the leadership and all the principal factions of both parties, the oldest and wealthiest person to be elected, and the first of a business background. He ran against the system, both parties, and almost all the media and the polls, to "drain the swamp," against the OBushtons: all the Clintons and Obamas and Bushes and the Republican and Democratic lookalike also-rans (Carter, Dukakis, Quayle, Gore, Kerry, McCain, Romney). The only alumnus of that latter school still in good odor is the 93-year old Robert Dole, vice-presidential candidate in 1976 and presidential candidate in 1996. Trump is not a new broom sweeping clean; this was the big wolf blowing the house down into rubble and splinters and shards. In place of the scrimping Mother Hubbard Pentagon of Robert Gates, Leon Panetta, Chuck Hagel, and Ashton Carter, we will have combat military officers rebuilding a military capability adequate to all reasonable needs, accompanied by a prudent foreign policy that rejects George W. Bush's hip-shooting nation-building and Barack Obama's phantasmagorical conjuration of a friendly Iran and Hamas — a vastly increased strategic capacity to achieve much more realistic objectives. Each major domestic-policy department of government is being entrusted to people dedicated to radical change, to the uprooting of a whole generation of error. Education will go to a great champion of chartered schools (Betsy DeVos), in the hope of wrenching the country's failed public-education system from the palsied hands of the Democratic party's decayed allies in the teachers' unions. Labor itself will be in the hands of someone (Andrew Puzder) who supports the workers by guaranteeing their rights and liberating them from the corrupt enemies of workplace efficiency and cooperation in organized labor – a barely living group reduced now to the infestation of public-sector unions (only 6.7 percent of the country's shrinking work force is now unionized). The Environmental Protection Agency will be in the hands of someone (Scott Pruitt) who does not believe the unsubstantiated ecoterrorism about global warming and will protect the environment without throwing millions of people in carbon-related energy into unemployment in the fatuous professed expectation that they will be reemployed building windmills and solar panels. Health care will be in the hands of the greatest expert in the Congress (Tom Price) on how to introduce a dual-payer (where affordable to the insured family) universal-health-care system that does not lie to the taxpayer, separate the patients from their doctors, or preserve statewide insurance fiefdoms. Taxation, campaign-finance reform, and the budget will be in the hands of people (Steven Mnuchin at Treasury) who will raise revenue from elective transactions and reduce taxes for small personal and business income earners. Apart from 1960, 1968, and 1980, all transitions from 1932 to this one have been mere changes of personnel. This is a revolution: There has not been such a transition since Roosevelt in 1932, if not Jackson in 1828, when the new president sacked much of the senior civil service and eventually revoked the charter of what was in effect a national bank. Donald Trump's landslide is in the profundity of his mandate to institute massive changes, not the margin of his victory over a terrified coalition of lookalike candidates. It does not serve his purpose to expound the extent of the changes that are about to be wrought: tactically better to say little of it as the Republican leaders in Congress prepare a blockbuster legislative session, and the concussed survivors of the old order and the dazed Washington press corps mill about like grumpy sheep complaining of Trump's status as proprietor of his television program, and his betrayal of laissez-faire economics in incentivizing the retention of jobs at the Carrier air-conditioning company. As there was never any serious argument for reelecting the Democrats, their whole campaign was to defame Trump as a sexist and a racist. There was never a jot of truth to any of it, as his cabinet appointments are showing. Trump's popularity is rising steadily and most Americans think Obama has already gone as president. The president-elect is driving a bulldozer at 60 miles per hour toward the wreckage of decades of misgovernment and misinformation, while the departing incumbents crawl around on their hands and knees complaining that the lights have gone out. For them, they have.